A big concern for most traders who profit from algorithmic strategies is whether or not those strategies would be able to survive large scale fundamental market changes. The most important changes are related with both political events and overall replacement of currencies and merging/separation of large economies. This has been an important question for me during the past few months since it involves one of the most relevant aspects of trading system development, robustness. During today’s post I will show you the results of my experiment across fundamental market changes and what happens when we apply strategies developed on another currency pair to an entirely new market instrument which has a very different overall makeup and structure. A large number of the aspiring traders I know are somewhat concerned about the stability of the European Union and the future fate of instruments like the EUR/USD. People are genuinely worried about the fact that if their systems are mainly developed to trade EUR related instruments they will have absolutely nothing to trade if the European Union decided to split at some point within the next few years or decades. Other similar changes involving major economic sectors also worry traders since they are always concerned about the ability of their systems to tackle any change in overall market conditions. The simple question then becomes if it is possible to trade a system developed over a certain instrument across a changing period towards an instrument which is not only different but completely new in nature and which totally replaces the previously traded currency pair. This question cannot be answered very easily since these events are extremely rare and therefore the opportunity to test strategies against this unique type of change does not present itself quite often. One of the few times when such an event has happened corresponds to the creation of the European Union and the replacement of all currencies of common wealth countries for the Euro. If you were trading before this merge happened you would have probably traded the DEM/USD (Deutsch Mark Vs US Dollar) pairs as this was the most liquid European Union currency prior to the large scale merger of different currencies. If you had developed your systems to trade the DEM/USD then it would have been critical for your to maintain a similar level of profitability and risk when the new currency appeared. 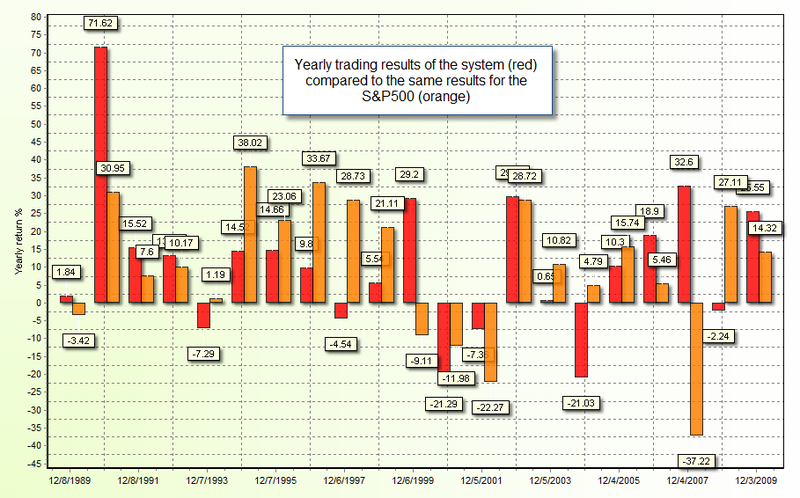 In order to test the above hypothesis I have used DEM/USD data from 1990 to 1999 to develop a trading system using our genetic framework and I then tested the strategy over the whole 1990 to 2011 period (DEM/USD till 1999 and then EUR/USD till 2011), putting the system against a huge stress test showing what a real trader would have experienced if he or she would have attempted to trade a DEM/USD designed strategy on the new and completely different EUR/USD currency pair. This exercise is very interesting as it shows whether or not you can successfully trade a strategy on an instrument which is fundamentally different which also replaces the previously traded currency pair. The results were actually not only good but better than the results for similarly developed individual systems on other currency pairs which didn’t change. The 10 year out-of-sample test achieved profitable results, especially getting significant profits for the past 5 years of trading. Although the profit and draw down characteristics of this system are not that good (AMR to maximum draw down ratios is about 1:3) it does show that the strategy does not deteriorate significantly when moving into the out-of-sample testing period. It is also worth noting that this is not a statistical anomaly and all the tested developed systems (more than 10) managed to survive with better or similar results within the 10 year out of sample testing period. Why does this happen ? Why is a system able to survive within a completely different symbol ? The answer here is mainly that even though the DEM/USD disappeared as the EUR/USD took shape the overall economic characteristics and trading partners involved within the DEM/USD moved to do their business on the EUR/USD. Other Euro partners who also moved into the EUR/USD pair did not contribute to the deterioration of the fundamental aspects of the currency pair as they share the same overall market time zones and overall liquidity additions tend to make pairs more technical and easy to trade (and not the other way around). It then seems that what happened was a simple “change of name” to a much more liquid pair where the DEM/USD traders were simply a subgroup of a larger trading conglomerate (although a very large portion of EUR trading comes from Germany). The fundamental inefficiencies discovered on the DEM/USD were therefore automatically exported into the new pair. This exercise teaches us that although the instruments representing certain economies may change, the overall economic aspects and intrinsic currency value is still present within instruments that replace old ones. Therefore the changing of instruments is not something to fear as even if the EUR/USD ceased to exist, the wealth of its most liquid partners and all the trading going on on the EUR/USD would have to go to some type of trading instrument in which at least some part of the inefficiencies exploited would remain. The above example shows that the EUR/USD preserved some of the inherent exploitable inefficiencies of the DEM/USD and it is very likely that the same process would follow if the opposite change was carried out with a preservation of at least a good part of the profitability and risk characteristics of strategies designed to trade the EUR/USD. As a matter of fact, if you carry out this test in the opposite way (design a system from 2000-2011 on the EUR/USD and then out-of-sample test it from 1990-1999 on the DEM/USD) you get quite similar results as the ones shown above. This is really interesting finding. Do you think that splitting EUR to EUR and DEM will cause current Asirikuy systems, working on 1H timeframe and trading instruments, other than EURUSD, become obsolete?